It is said that the key to French cuisine is attention to detail. The entire line of ProtiDiet products from Pro-Amino International in Quebec reflects that French cooking heritage in a variety of functional and flavorful diet foods made from high quality, easy-to-digest proteins. Keeping the calories, sugars and carbs low while delivering great taste in a wide range of products is how ProtiDiet foods and snacks can help you achieve your weight loss or weight management goals. 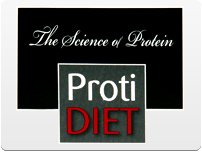 Diet Direct is proud to be your source for ProtiDiet protein diet products. Make dieting easy by stocking up on delicious and healthy ProtiDiet foods from Diet Direct. These diet foods are made with attention to detail that gives a nod to the French cuisine heritage of this Quebec-based brand. This dedication to creating quality low-calorie foods results in functional and flavorful creations that you’ll love to eat. These diet meals, snacks and desserts are made with easy-to-digest proteins that will keep you feeling full. They’re also low-calorie, low in sugar and low-carb to ensure that they comply with your dietary restrictions and are as healthy as possible. In addition to providing great nutritional value, ProtiDiet foods also taste great and are useful tools in achieving your weight loss or weight management goals. ProtiDiet foods are made with high-levels of protein in order to keep you satisfied long after you’ve eaten. High-protein foods and high-protein diets can be very effective when used for weight loss and overall health. Increasing your protein consumption will help keep you full even when you’ve reduced the number of calories in your diet. It can also help regulate your blood sugar levels and increase your energy. Extra protein in your diet can also help your body absorb key nutrients and will ensure that you get the most out of your workout. Use our ProtiDiet high-protein meals and low-calorie snacks to effectively stick to your high-protein diet without sacrificing taste or quality. We offer a wide variety of ProtiDiet food products. Some of these include ProtiDiet entrees, breakfast, soups, snacks, protein bars, desserts, shakes and drinks. These include delectable high-protein treats, such as sugar-free chocolate bars, fiber bars, diet cereal, instant oatmeal and even low-calorie pancakes. Make it easier to choose which products you’d like to order by sorting them by flavor. You can also sort them by the number of calories per serving, the grams of protein per serving and the type of protein included in the recipe.